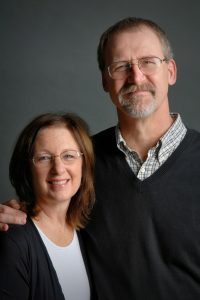 Matt & Laurie Gray both came to faith while college freshmen at Oregon State University, in Corvallis, Oregon. Matt was led to faith through the ministry of Navigators, and Laurie came to faith through Campus Ambassadors. They were married in 1980 and after finishing school in 1981, they joined the staff of Campus Crusade for Christ. They served with CCC at Mankato State University, Central Washington University and the University of Idaho. In 1995 they launched Student Evangelical Fellowship, which later became Collegiate Reformed Fellowship, a ministry of Christ Church and Trinity Reformed Church in Moscow, Idaho. They have been married 36 years, have 7 children and 10 grandchildren. They’ve lived in the same 100 year-old farm house for 26 years. In his spare time, Matt enjoys handy-manning around the house, hunting and cutting firewood with the boys. Laurie is a homemaker, mother and grandmother par excellence, with a knack for making things delicious and beautiful. She is very active in ministering to the college gals and also works part-time out of our home as a seamstress and monogrammer.